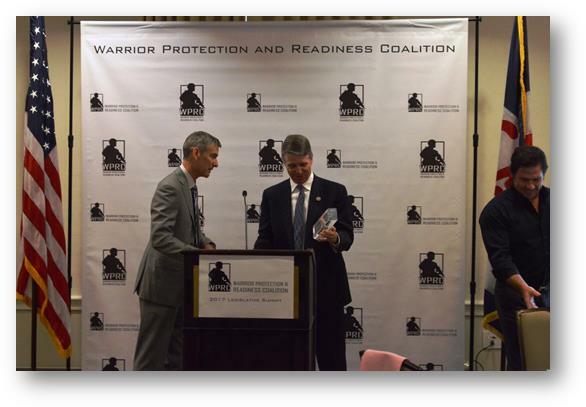 WASHINGTON – Congressman Rob Wittman (VA-01) today received the Warrior Protection and Readiness Coalition (WPRC) Sentinel Award for his support of American service members. The Sentinel Award specifically recognizes Rep. Wittman for his advocacy to provide servicemen and women with high quality, American made military clothing and equipment, such as body armor, combat clothing, boots, and helmets. The Warrior Protection and Readiness Coalition (WPRC) Sentinel Award is the association’s highest honor, presented annually to policymakers who have demonstrated extraordinary support for the American industry that manufactures advanced combat clothing and equipment for the Armed Services. WPRC member companies strive every day to provide innovative, advanced solutions to ensure that our armed forces are prepared for any encounter, anywhere in the world.